Steep Dilmah Luxury Leaf Evening Tea in just boiled water for four minutes and then strain and cool. Juice four of the blood oranges to give around 330ml liquid and then heat up orange juice with sugar and bring to the boil. Simmer for 4-5 minutes over a low heat and then leave to cool for 10 minutes. 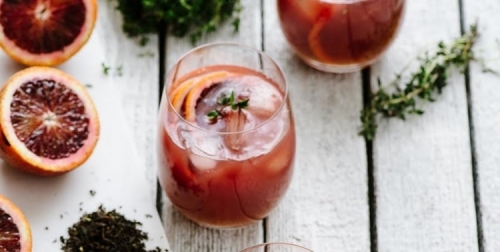 In a jug or bowl, mix tea, orange juice and spiced rum together. Slice remaining orange into medium-thick slices. To serve, add two orange slices and a sprig of thyme.